MCT oil can fill in the “brain energy gap” that occurs with aging–the difference between how much energy the brain needs and how much it receives. Research by University of Tokyo and Nisshin Oillio shows that lauric acid which is 50% of coconut oil stimulates ketone production in astrocytes, which are cells that nourish other brain cells. A New Way to Produce Hyperketonemia: Use of Ketone Ester in a Case of Alzheimer’s Disease. Newport MT, VanItallie TB, Kashiwaya Y, King MT, Veech RL Alzheimers Dement. 2015 Jan;11(1):99-103. Ketoacids? Good Medicine? George F. Cahill, Jr., Richard L. Veech , Transactions of the American Clinical and Climatological Association , Vol. 114, 2003. The therapeutic implications of ketone bodies: the effects of ketone bodies in pathological conditions: ketosis, ketogenic diet, redox states, insulin resistance, and mitochondrial metabolism Richard L. Veech, Prostaglandins, Leukotrienes and Essential Fatty Acids , 70 (2004) 309-319. Ketones: Metabolism’s Ugly Duckling, TB VanItallie, TH Nufert, Nutrition Reviews , Oct 2003, Vol. 61, No 10, 327-341.
www.freepatentsonline.com — Combinations of medium chain triglycerides and therapeutic agents for the treatment and prevention of Alzheimer’s disease and other diseases resulting from reduced neuronal metabolism,United States Patent 20080009467, Inventor Samuel T. Henderson, Accera, Inc., Broomfield, Colorado (Ketasyn). www.accerapharma.com — Ketone Bodies as a Therapeutic for Alzheimer’s Disease, ST Henderson, Journal of the American Society for Experimental NeuroTherapeutics, Vol 5, 470-480, July 2008. 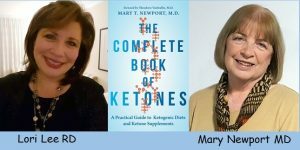 Mary Newport MD is a speaker for Pruvit KetoKademy May 30, 2019, followed by MORE May 31 to June 2, 2019 in Orlando, FL. Many great speakers--researchers, implementers and inspirers!